Those with the vision of eternity can see that the imperishable soul is transcendental, eternal, and beyond the modes of nature. Despite contact with the material body, O Arjuna, the soul neither does anything nor is entangled. A living entity appears to be born because of the birth of the material body, but actually the living entity is eternal; he is not born, and in spite of his being situated in a material body, he is transcendental and eternal. Thus he cannot be destroyed. By nature he is full of bliss. He does not engage himself in any material activities; therefore the activities performed due to his contact with material bodies do not entangle him. He is called anddi because he has no original cause. But just as anuttama can mean parama uttama taking the ablative sense of the word (no one higher than him), so anadi, “having no cause”, can mean the supreme cause (no other cause than him). Therefore because he is the final cause (anaditvat), and because the gunas such as creation and destruction arise out of him (nirgatah + guna = nirgunatvat), this paramatma is distinguished from the jiva. At all times, in all circumstances, he is without decrease in his own knowledge, bliss and other qualities. Though situated in the body, because he does not take up the qualities of the body, he does not think he is a doer like the jiva (na karoti), nor does he become an enjoyer, nor does he get contaminated by the gunas of the material body (na lipyate). It may be further postulated that differentiation of the atma or immortal soul is inevitable due to karma or reactions to actions arising from its connection to the physical body which results in happiness, misery, etc. as the jiva or embodied being transmigrates continuously in material existence; so how can there be equalness and sameness? 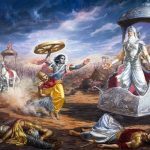 Lord Krishna addresses this doubt by explaining that paramatma the Supreme Soul is without a beginning, without material attributes, transcendental, immutable, imperishable. Therefore paramatma although residing in a physical body which has a beginning and is perishable, possessive of attributes and subject to karma it paramatma is unaffected by the result of any action as it only monitors and never acts. 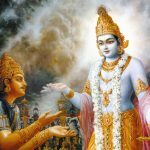 Lord Krishna explains that there is no annihilation for paramatma or the Supreme Soul as it is not material but completely spiritual and eternally existing. Normally material things are subject to disintegration and are subject to the decaying effects of time. But this is not applicable to paramatma which has no relationship to material nature and is never implicated or affected by the activities of the jiva or embodied being. The word nirgunatvat means the absence of qualities and attributes this denotes that paramatma has no material qualities and material attributes due to being completely spiritual. The jiva is established in the physical body. The Supreme Lord is His localised expansion as paramatma is causing the jivas to sleep at regulated intervals and is giving illumination to them. Yet the Supreme Lord remains without sleep and is full of illumination. The jivas established within the physical bodies identify themselves as their body. Yet the Supreme Lord even though dwelling within each and every physical body all over creation never identifies with the physical body. Experiencing pleasure and pain in the physical body makes one become attached to it. Due to the absence of the material and presence of the spiritual the Supreme Lord has no attachment to the physical body of any jiva. Because the Supreme Lord is eternal, without any beginning and is devoid of any material attributes, qualities or accruements. The Supreme Lord is always distinctly exalted and superior to all jivas who are always subject to birth and the three fold miseries of old age, disease and death. Everything is created completely from the Supreme Lord alone, who is one without a second. Yet He is totally neutral and impartial to His creation. Even though residing within the physical body as paramatma of every jiva the Supreme Lord is witnessing all the activities performed. Yet no merits or demerits are attached to Him. This is the true purport of the ancient aphorism of neti neti meaning not this, not this. It may be comprehended that paramatma the all pervading Supreme Soul as well as the localised atma or the immortal individual soul are both distinctly different from prakriti or the material substratum pervading physical existence. It may also be understood that it is only by the medium of prakriti that bodies and senses manifest and cause the jiva or embodied being to engage in activities which gives karma or reactions to actions. But the question may be raised that if paramatma and the atma have such intimate contact with the physical body which is experiencing joy and grief as it performs unlimited activities; then how are they both not affected, implicated and contaminated by such enactments and remain only the witness and monitor. 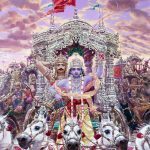 Anticipating such a query Lord Krishna answers that they are both anaditvan nirgunatvat meaning eternal without beginning and possessing no material qualities or attributes whatsoever. Imperishable the knower of the sphere of activity, supreme because they are transcendental to prakriti and everything material including the physical body, mind and intellect which is in specific illustrative examples sometimes referred to as the self. Whatever has manifested from prakriti possesses the three gunas or goodness, passion and nescience and are perishable. 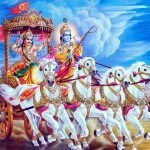 This comprises the scope of prakriti but paramtama and the atma are not implicated by the physical body or influenced by its modifications thereof and therefore are only monitoring all thoughts and actions as the witness. 13.31-34 Yada etc. upto na upalipyate. 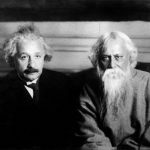 When [a man of Yoga] perceives the mutual difference i.e., separateness of all beings (all mutually different beings) in the very Self on account of Its all pervasive nature and realises the said difference as having sprung up from the Self alone – even then he does not get any stain. For [in that case] he would be the creator (or performer) of all. For, he is none but the Supreme Self; and though residing in the body, he is not stained just as the Eather is [not stained]. anāditvāt — due to eternity; nirguṇatvāt — due to being transcendental; parama — beyond material nature; ātmā — spirit; ayam — this; avyayaḥ — inexhaustible; śarīra-sthaḥ — dwelling in the body; api — though; kaunteya — O son of Kuntī; na karoti — never does anything; na lipyate — nor is he entangled. It is commented that “Paramatma” resides in every one who is beyond “sato, rajo and tamo” meaning “nirguna”. Paramatma is also “anadi” and “avyaya” meaning eternal, immutable and imperishable. In such a case, I have a doubt why people commit sins and become “papatmas” instead of becoming “punyatmas” ? I wish an answer to the above.